Too Darn Hot put in a high-class display at Sandown and was subsequently promoted to favouritism for next year’s Investec Derby. An impressive seven-length winner on his debut over a mile, the John Gosden-trained colt was stepping up in class but down in trip for the Group Three, won by subsequent Epsom hero Masar 12 months ago. Gosden had been inclined to keep him at a quiet level after his racecourse bow, but such is his talent he was tackling a race the trainer has claimed in the past with the likes of Raven’s Pass and Kingman. 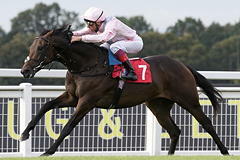 Too Darn Hot showed signs of greenness at times and was keen enough early and then caught a little flat-footed entering the straight, but once Frankie Dettori got the even-money favourite organised the result was inevitable. He was far from beating trees, Royal Ascot winner Arthur Kitt gave vain chase in second, but could only finish four lengths behind the even money favourite with Confiding another three and three-quarters away. Dettori told ITV Racing: “He’s Too Darn Hot, that’s for sure! “I kept him up to his work because I suppose the next target will be a Group One, but I don’t know where. He’s won his Group Three very easy and the next step should be a big race. “At the moment he’s got plenty of options, we’ll have to see how he does in the winter, but at the moment the world is his oyster. Thady Gosden, assistant to his father, said: “We couldn’t be happier, he was a bit green early in the straight, but then Frankie got hold of him. “He’s always shown plenty of ability at home and it’s quite good that he can transfer that to the course.